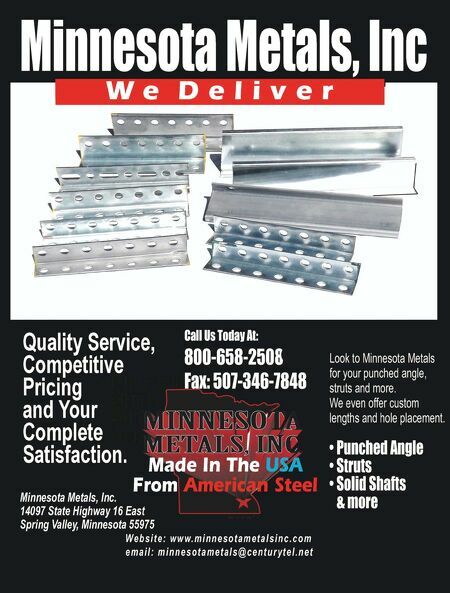 HARDWARE For More Information Call Our Customer Service Dept. TODAY! Toll Free: 1- 800-628-3667 Toll Free Fax: 1- 800-628-3295 www.natdoor.com "And Just About Anything Else You Can Imagine!" CONTROLS FASTENERS "Lifting The Industry For Over 40 Years" Cable Safe Eliminates dislodgement of torsion spring lift cables. Commercial/Residential Cable Tensioning Device. Works exceptionally well with Jackshaft Operators. New! 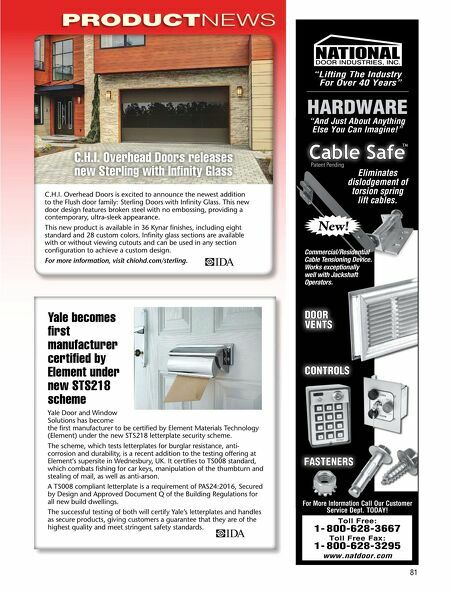 Patent Pending TM DOOR VENTS 81 PRODUCTNEWS C.H.I. Overhead Doors is excited to announce the newest addition to the Flush door family: Sterling Doors with Infinity Glass. This new door design features broken steel with no embossing, providing a contemporary, ultra-sleek appearance. This new product is available in 36 Kynar finishes, including eight standard and 28 custom colors. Infinity glass sections are available with or without viewing cutouts and can be used in any section configuration to achieve a custom design. For more information, visit chiohd.com/sterling. C.H.I. Overhead Doors releases new Sterling with Infinity Glass Yale becomes first manufacturer certified by Element under new STS218 scheme Yale Door and Window Solutions has become the first manufacturer to be certified by Element Materials Technology (Element) under the new STS218 letterplate security scheme. The scheme, which tests letterplates for burglar resistance, anti- corrosion and durability, is a recent addition to the testing offering at Element's supersite in Wednesbury, UK. It certifies to TS008 standard, which combats fishing for car keys, manipulation of the thumbturn and stealing of mail, as well as anti-arson. A TS008 compliant letterplate is a requirement of PAS24:2016, Secured by Design and Approved Document Q of the Building Regulations for all new build dwellings. The successful testing of both will certify Yale's letterplates and handles as secure products, giving customers a guarantee that they are of the highest quality and meet stringent safety standards.